I can’t believe that time of year is upon us once again, I’m definitely feeling the crispness in the morning air. Though I’m always sad to see our summer season over, I do so love the Fall, with all of it’s spectacular colors. 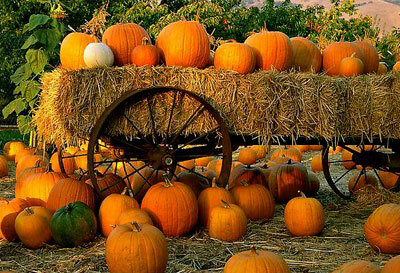 Among the wondrous things about fall are pumpkins! Did you know pumpkins are in the Curcurbita family along with squash and cucumbers. Besides eating the inner meat, and roasting the seeds, you may also eat the gorgeous yellow flower blooms! Lightly saute them in olive oil, and season as you like, super simple! Early American settlers would hollow out pumpkins, then fill them with milk, honey and spices and bake them, according to some historians that was our country’s first pumpkin pie! Lastly the largest pumpkin on record weighed a whopping 1,469 lbs! I am planning to bake fresh pumpkin pie this year, and will be heading to my local farmers market soon to purchase a few baking pumpkins, can’t wait! Checkout this delicious pumpkin pie recipe!